Are you new to the forum? Do you want to meet other new members and/or not want an introduction thread to yourself? Well, welcome to the New Member Meet and Greet! Meeting people is hard when you're new, but it's easier when everyone else is new, too! 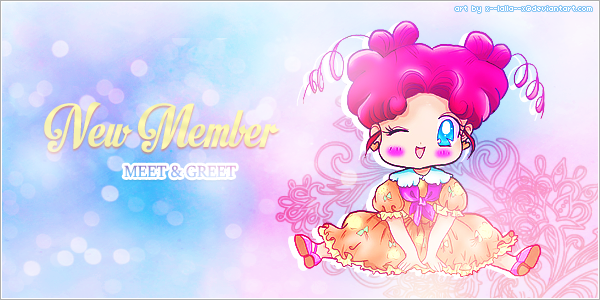 The New Member Meet and Greet is for new members to meet each other and be welcomed to the forum! So stop by and chat! Who's your favorite senshi? What's your favorite episode? How did you find GC? How long have you liked Sailor Moon? Do you have any cool or weird talents? Tell us about yourself! All that to say, welcome to GC!! This serves to refresh our old "New to GC" thread, which wasn't getting any action. New members, come meet other new members!! Hello. It's nice to meet you. My name is Miko and I hope to get along with everyone. I'm 21 but I'm going to be 22 this month. I live in beautiful, sunny So-Cal. My nick-name is, in fact, Miko and my childhood nick-name is MikoMouse, my real name is Tamiko. I don't have any pets but I used to. I had two guinea pigs, one named Amy, the other Ivy. I enjoy reading copious amounts of fanfiction and spending borderline unhealthy amounts of time online. I've loved reading since I was little and hope to some day become an Author. Please don't ask me to choose my favorite book. That's like trying to choose a favorite child. I will however tell you my first Book series. It was the Inkheart series by Cornelia Funke. The first anime I ever watched was Sailor Moon and to this day is still my favorite. I now enjoy a wide variety of anime and manga. My favorite genres are Comedy, Idol, Magical Girl and most ones with a female main character. I found GC by looking up BSSM Role Play groups on Google. Welcome to the forums, Miko! Who's your favorite Sailor Moon character? What about story arc? Also your avatar is adorable! Which anime is it from? Thank you very much. My top three Sailor Moon characters are Hotaru/Sailor Saturn, Haruka/Sailor Uranus and Makoto/Sailor Jupiter. My favorite story arcs would be the first one and Sailor Moon S. My avatar is from A:TLA. It's a purple pentapus. Hi! I'm usagi-serenity, but my name irl is Emily. I made a post saying that I'm new here, but I thought I would post here too. Hello, I'm SelectedLime375. I used to watch Sailor Moon when I was little. About a year and half ago, I found out about the Sailor Moon S.H. Figuarts and started watching the original dub again. Re-watching the dub has been fun and I've had a great time getting back into Sailor Moon. I've gotten most of the Figuarts and almost have a complete set of DVDs for the series. I've also made a Sailor Moon LEGO project. Some things I like aside from Sailor Moon are programming, Transformers, LEGO, Marvel, and collecting. Welcome to the forums, SelectedLime! I really like your avatar! I love your name! <3 welcome to the forum! I'm Starchild nut usually called Leeks or Star. Feel free to drop a pm if you wanna talk about figures. I love them. I'm also down to talk about pixel art all day everyday. Welcome, lime! I'm super interested in the lego project you said you're doing! Are you trying to do scenes from the show, characters, or the various settings? How far are you along, and are you comfortable sharing pictures of your progress? I built a Moon Kingdom castle in LEGO Digital Designer and designed a bunch of minifigures. I'd love to share pictures of it. I'm guessing the Artists section would be a good place to make a thread for it. I have it proposed as a set on LEGO's Ideas website. I can't link to it right now, but if you go to the LEGO Ideas website and search "Sailor Moon" you should be able to find it. I built a Moon Kingdom castle in LEGO Digital Designer and designed a bunch of minifigures. I'd love to share pictures of it. I'm guessing the Artists section would be a good place to make a thread for it. :00 That's awesome!! I think that fits in the Artists section, sure! I made a thread for it. I still can't post links yet, but it's tiltled "[MM] SelectedLime375's LEGO Sailor Moon Projects"
My favorite senshi is Minako, and I like S and Sailor Stars very much! I don't really remember how I encountered this site, but it was probably through web searches or some stuff like that. I work on a Sailor Moon fan-game sometimes, and I hope to cosplay as Sailor Venus someday! Hi there! I like S too - it’s my favorite season! That’s really cool that you work on a fan-game! So are you into coding or are you more into the graphics/art aspect? If you ever do cosplay as Sailor Venus, you should share your photos with us! Welcome to GC - I hope you like it here! If you have any questions or just want to chat, feel free to shoot me a PM! Welcome nm___i3bfc! So happy to see another Minako fan hehe! I'm the mod over in the Sailor Moon Discussions Section. Hope to see you there soon ^_~. Btw, is there a story behind your username at all? Programming, though I wish I could draw well! Welcome! It's always great to meet another game dev. I've got a thread in the Artist section for the game I'm working on. If you ever make a thread for your game, I'd love to see it. Sorry for the late hello, I'd somehow missed that there were new posts here.